The Bijou shower curtain is a polyester shower curtain is a luxury fabric shower curtain designed and produced by well-known German brand Kleine Wolke, established in 1968, and is backed by their quality guarantee. No liner is necessary. Quick-dry and easy-care polyester fabric, durable and long wearing. 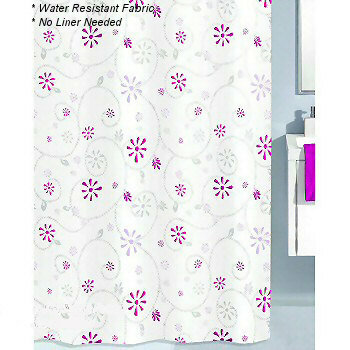 Berry : Retro flower design shower curtain with a solid white background. Bright deep pink, lavender and deep berry purple flowers with grey vines, flowers and leaves.